DVD was captured in high quality from the camera which was set to LOW AGC. Exposures were accumulated to reveal the outer nebulosity and also the central trapezium area. The Star Party was a success with a large number of visitors attending. It was a joint event by Swansea, Port Talbot and Bridgend Astronomical Societies held at the Bridgend AS meeting and observing venue. A small exhibition of astronomical images and two simultaneous lectures were held inside the modern Nature Reserve building. Outside, a number of telescopes were available for members of the public to view through. 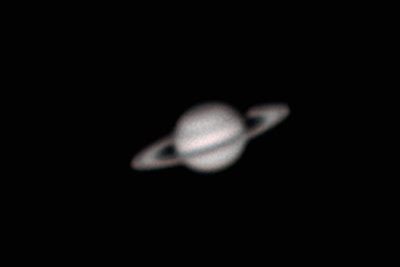 The early evening was largely cloudy with Jupiter being available for viewing for most of the evening. Towards the end of the evening the clouds largely cleared and visitors were able to view The Orion Nebula and the Pleiades. Many thanks to Dr Carlos Nunez of Swansea University who gave us an excellent, thought-provoking and very accessible talk about some principles within Physics at our meeting tonight. 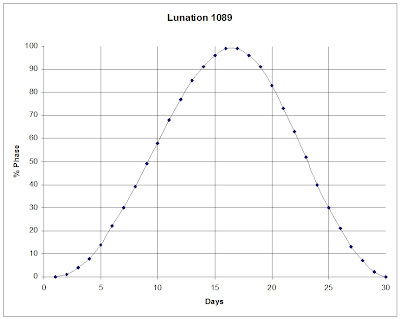 We look forward to seeing whether new discoveries at CERN will fit into the existing theories of Least Action! 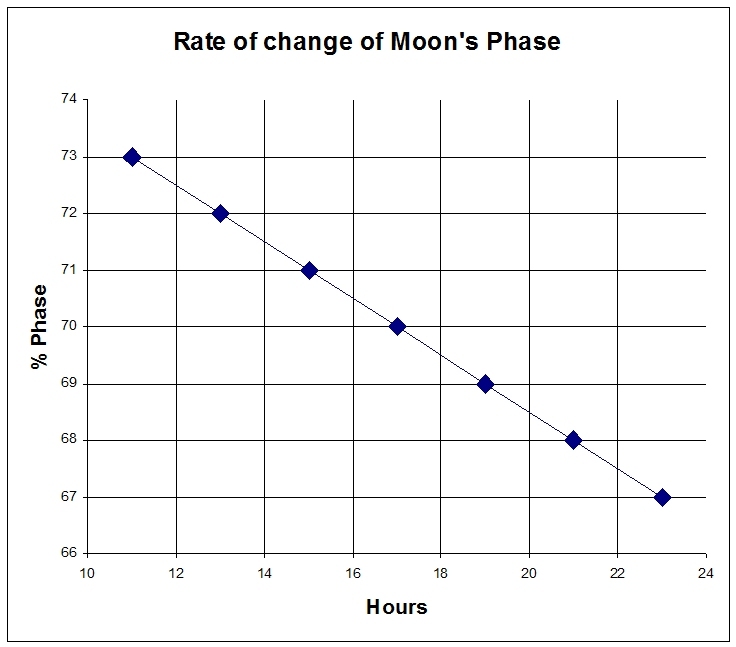 It is worth observing or imaging the Moon as early and as late as possible during an observing session as significant changes to the illumination will have taken place during much of the lunation. 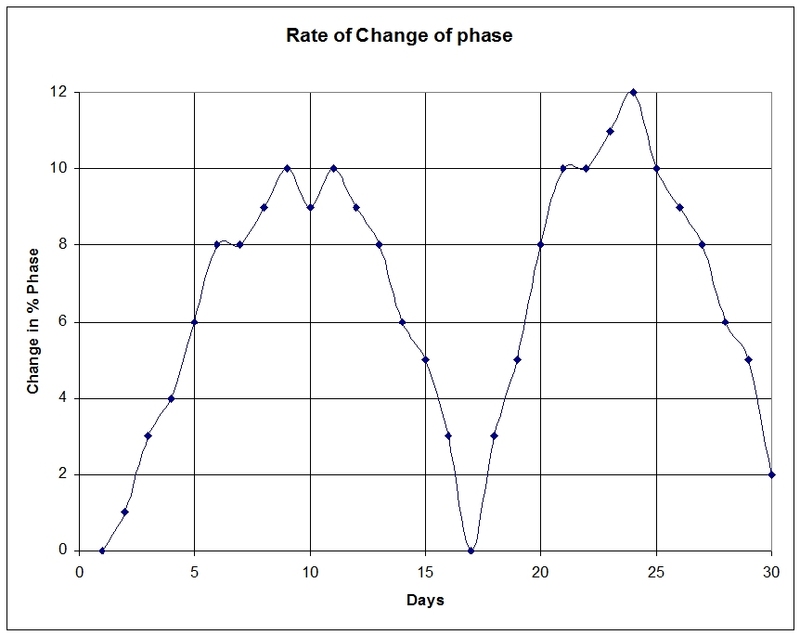 There is a very significant part of the lunation where the change in % phase is almost linear over time. 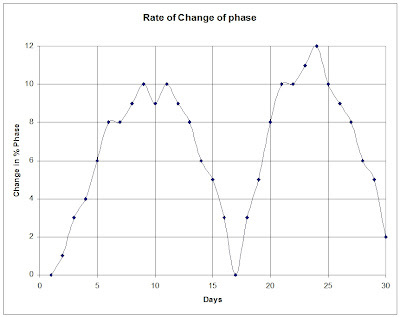 The next graph shows the rate of change of the % Phase and it shows that the greatest rate of change occurs a couple of days on either side of about day 10 and day 22 of the lunation where the slope of the previous graph is steepest. 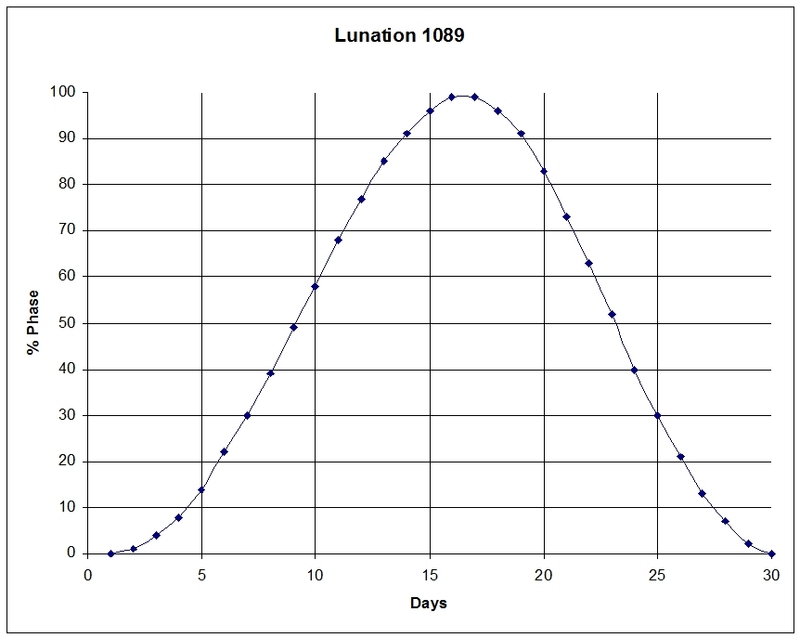 This is the time of the lunation to make an early and a late set of observations of the Moon, to see change take place over a few hours. 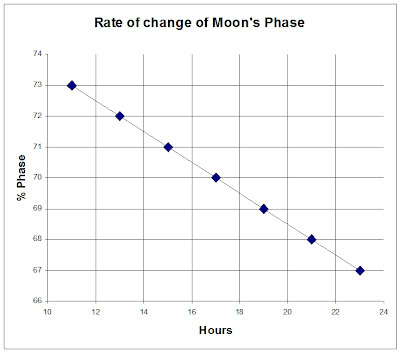 The graph is not an exactly smooth curve because the values used are the integral parts of the Phase % that is reported by Moontool which does not report the fractional part. Last night I used an Opticstar PL-130M monochrome 1.3 Mp CMOS camera set to 640 x 480 at the prime focus of a 5", f/10 Maksutov.